Assess Personal Property Online online. Arkansas law requires that all property owners assess their personal and business personal property between January 1st and May 31st each year. A 10% late assessment penalty will be applied to all property not assessed before the deadline. 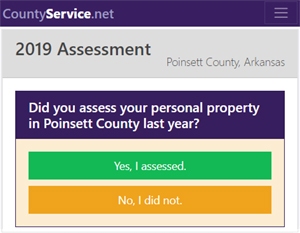 Personal property assessments may be done in person at our office in Harrisburg, by phone at 870-578-4430 or if you have assessed in Poinsett County in the past and only need to reassess, you can assess online.